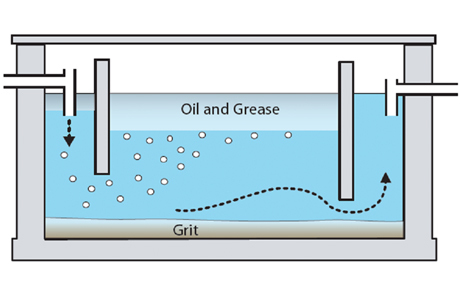 Grease traps, also called grease interceptors or grease converters, are plumbing devices which are designed to help catch grease and other materials before wastewater go into disposal systems. Common wastewater is not entirely water. It also contains oil and other particles. These things cause a floating scum layer to form. Small amounts of oil and other particles can be manage, however, large amounts of oil and food particles from restaurants and food chains can overwhelm the treatment facility and cause blockages in pipes. Sludge is a natural bi-product for many industries, including industrial wastewater treatment or sewage treatment plants, and is one which has the capacity to cause delays in production. At McGuinness Maintenance Services we utilise an innovative range of sludge harvesting and processing technologies as part of our complete waste management solution. > Planned maintenance of grease traps working around customer's time lines. > Prevention of blockages and pollution from contaminated drains and pipe work. > Reduction in FOG limits and compliance with your Trade Effluent Permit or License. > Provision of service to canteens, restaurants, hotels, bars, garage forecourts, delis, hospitals and much more. > Waste consigned to authorised EPA Licensed Treatment Facilities providing full certification of all waste removed. Drain cleaning should not be attempted without proper training and the right tools. Most plumbing and pipes in the house The sludge accumulated in a wastewater treatment process must be treated and disposed of in a safe and effective manner. The purpose of digestion is to reduce the amount of organic matter and the number of disease-causing microorganisms present in the solids. The most common treatment options include anaerobic digestion, aerobic digestion, and composting. Incineration is also used albeit to a much lesser degree. McGuinness Maintenance Services offer a complete professional service in property management and services. Owned and operated by Edenderry man Frankie McGuinness the company has first hand knowledge and experience in traffic management, drain cleaning and CCTV surveying. Operating 365 days a year, 24hrs a day and 7 days a week service. © Copyright 2014 McGuinness Maintenance. All rights reserved.